Every child loves a good old-fashioned steam train and when dad sees this one, he will want one too. It is a cute fun toy that perfectly resembles a train and is also a stress toy, ideal for getting rid of all that pent up frustration. Bash it and smash it in the office, in the meeting, at home or in the car when you are stuck in traffic. You will feel a million times better and ready to face the rest of the day. Our stress toys are small and easy to carry around and make trendy desk ornaments as well as being great for a healthy mind and body. 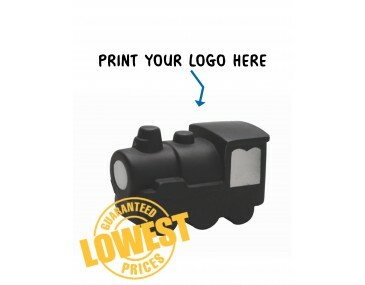 This cute train makes a perfect give-away for your trade shows, expos and product launches. Our stress toys are manufactured from a strong and durable material that springs back to its original shape, no matter how much strain they take. The train has the three-dimensional shape of an old engine. The colour is dark and the front grill and windows contrast in a metallic finish. Three sets of wheels that run on rails make the overall appearance look totally authentic. Get your clients squeezing and squashing these toys and noticing your brand when they keep them on their office desks. Talk to us about branding your company logo onto the trains, our listed price includes branding of your logo or graphic in a single colour print. We offer a product turnaround time of two weeks, but we can offer even faster turnaround times for special requests. This product is supplied in bulk quantities. For larger orders ask about our custom made indent production service.